Eggs: Green Lacewing eggs are oval and pale green. Just before the larvae hatch, eggs turn gray. The eggs are shipped in vials with food and a carrier such as rice hulls, bran or vermiculite. It is best to allow a few of the lacewing larvae to begin emerging from the eggs before releasing. As soon as a few emerge, release as soon as possible to avoid cannibalism. The best time to release is early morning or late afternoon. Eggs can be stored at no lower than 50°F for up to 48 hours. To minimize egg mortality, humidity should be approximately 75%. Warmer temperatures will speed up larval emergence, but the eggs should not be held at more than 80°F. For small areas, sprinkle the contents of the container(s) over the entire target area. For large areas you may need to mix eggs with additional inert ingredients such as vermiculite, bran, saw dust, etc. to help dispersal. You may also release eggs on every other row on alternating dates. If eggs are purchased on perforated hanging cards, hang the cards, from the hole in the card, near the underside of leaves in the target area. At 80° F, the green Lacewing eggs will hatch in about 4 days. They hatch with a voracious appetite. In fact, they are so hungry, they often resort to cannibalism if there is no other food source available. Lacewing larvae will attack almost any soft-bodied insect. They feed upon small worms, insect eggs, mites, immature whiteflies, etc. However, the larvae are best known for attacking aphids and each is capable of killing 30 to 50 aphids per day. Many aphids are eaten but many more are killed by being punctured by the Lacewing larvae. Each larvae will feed for about 3 weeks, then will roll up into a little white pupae and emerge as an adult in about 1 week ready to mate and lay about 100 more eggs. 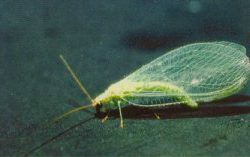 The adult Lacewing does not feed on aphids. The complete Lacewing life cycle takes 4 – 6 weeks.